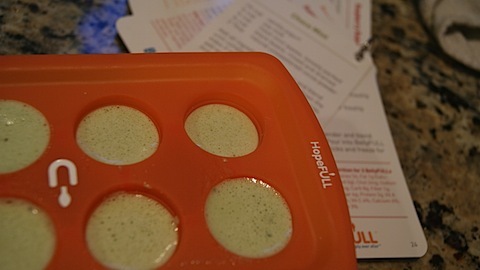 I was recently given the chance to review HopeFull’s BellyFULL Popsicle Making Kit. I was super excited because I knew Anna would love it. 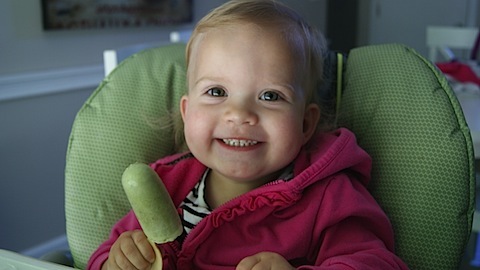 Another reason to eat a popsicle, yes, please. 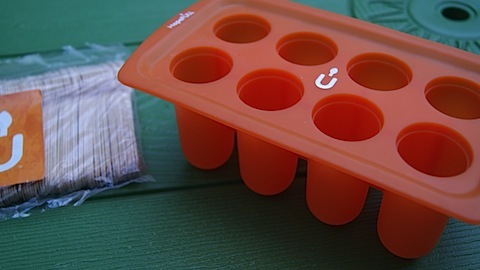 The kit included a silicone mold, pack of 100 sticks, healthful recipe book and kid’s chef hat. 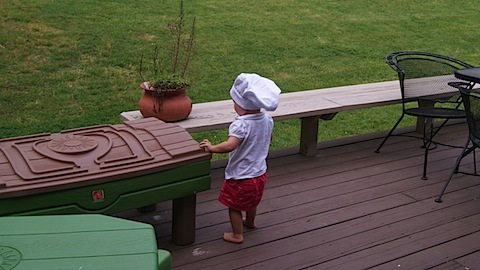 The chef hat was an automatic win. 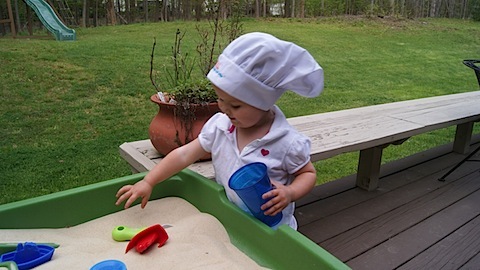 Until after the food in the sandbox was cooked for everyone. And I was very intrigued by how well the silicone mold would work. 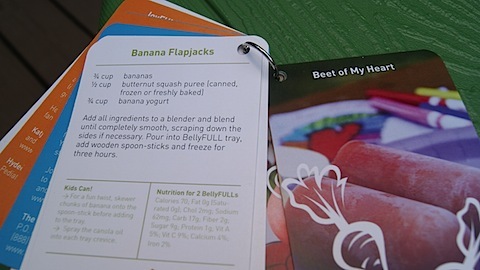 The BellyFULL Kit makes it easy to introduce whole foods to young children in an adventurous, playful way. BellyFULLs make eating whole foods fun for kids, and preparing them together can create memories which will last a lifetime. 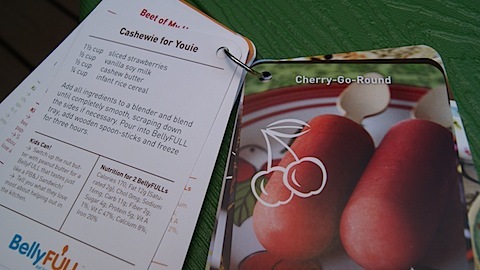 Before giving it a shot, I glanced through the well-photographed set of recipe cards. 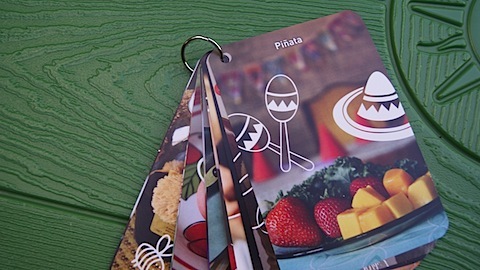 Each card featured a picture and a simple to read ingredient list of real ingredients that made great combos. I love that the recipes appealed to kids and grown ups as well. Almost every recipe included a vegetable pureed with the fruit. For example, the Beet of My Heart was the name of one combo. And the Banana Flapjacks include butternut squash. 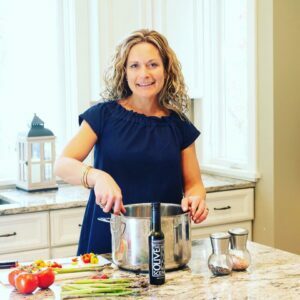 The idea behind the BellyFULL product is simple. 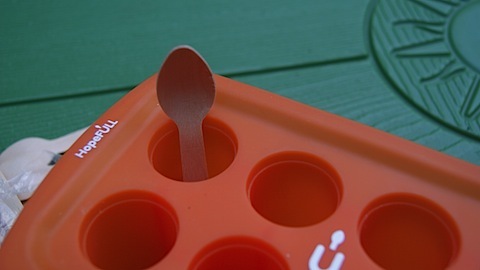 Blend a smoothie of sorts and pour it into the molds and insert the spoon shaped sticks for easy to hold popsicles. To try it out, I made up my own recipe . 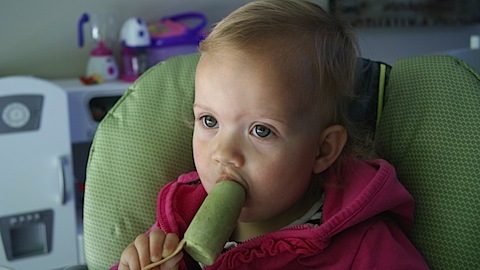 It was similar to our basic go-to smoothie recipe and I knew Anna would love it in popsicle form. 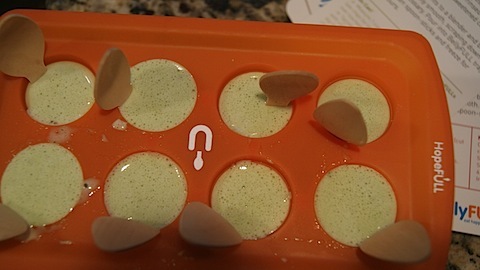 Process until smooth and fill the mold with the mixture. I still have not figured out how to make the spoons stay straight in the middle. I assuming you have to let things set up before inserting them, but I would be sure to forget to put them in if I didn’t do it in the beginning. What do you think she thought? I am looking forward to trying some of the combinations in the recipe book! Here is a little more info about each part of the kit. Make creative and playful frozen whole-food pop recipes that are sure to get your kiddos interested in (and eating) whole foods! 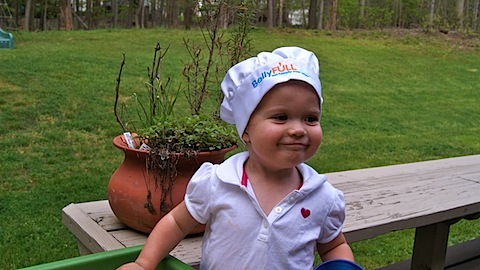 BellyFULL recipes are perfect for children 9 months and older. 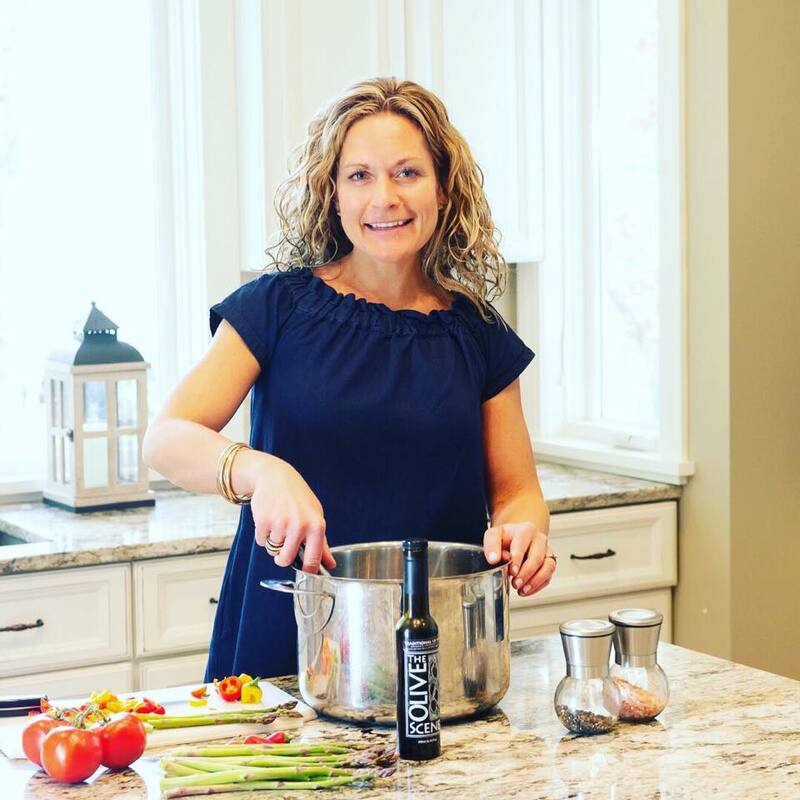 All recipes are gluten free. 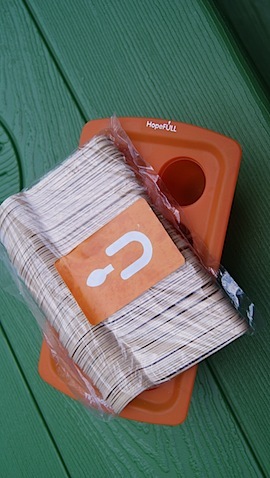 The BellyFULL Kit is PVC, BPA and Phthalate free. Does Anna drink whole milk? Or eat whole fat yogurt? Isabella still drinks whole milk, and Almond milk too sometimes. I always want to buy the Fage O% from Costco but feel like she still needs the fat? What do you think? I just recently stopped giving her whole milk when she turned 2 because my doc. said she could switch down to what I normally buy, until 2 she only drank whole milk. Now skim for the most part. She still eats whole fat yogurt or 2% whatever is in Stonyfield (She LOVES their squeeze yogurt from the tube when I freeze them – for a “special treat” she thinks!) but she also eats what I buy for me sometimes – which in this case was 0%. I usually buy the big one from Costco and add it to smoothies or other things but it’s just extra from what I already buy her. I agree they need the fat for their brain but now that she’s eating a better variety of foods, I am more open to throw things like that in her diet because it’s not all the time and I know she’s growing. What do you think?